Brown vs White Rice: Which Should You Be Eating? You are here: Home / Blog / Brown vs White Rice: Which Should You Be Eating? Brown vs White Rice: Which Should You Choose? Rice is a staple food throughout much of the world and is a significant component of modern diets in the Western world. Indeed, rice ends up being a particularly important ingredient if you are following a Japanese diet or something similar. There is a range of different types of rice, including different colors and shapes. But, the most common of these are simply brown and white rice. Conventional wisdom suggests that in the comparison of brown vs white rice, brown rice wins and is significantly healthier. This alone tends to make brown rice more popular. But, how accurate is that idea? After all, conventional wisdom isn’t always correct, particularly when it comes to nutrition. As a result, this post considers brown vs white rice and the actual differences between them. First of all, rice itself tends to consist almost entirely of carbs. In fact, both white and brown rice are composed of more than 80% carbs and contain relatively small amounts of fat and protein (1,2). But, there are still key differences between brown and white rice. Specifically, brown rice is a type of whole grain. So, it is whole rice with the outer hull removed (which is inedible). In contrast, white rice also removes the cereal germ, bran layer and the hull (3). This pattern affects the nutrient composition. The impact on nutrients isn’t especially surprising. After all, white rice basically has many of the healthy components removed. As a result, brown rice tends to be a better source of many nutrients. This can be seen in the table below, which compares the nutrients (based on RDI) for 1 cup of cooked brown vs white rice (4,5). As you can see, the only nutrient that is more prominent in white rice is thiamin. In other cases, nutrient levels are higher in brown rice, often by a significant margin. These differences alone are a key reason why many people choose brown rice over white. The end result is that white rice is mostly an ‘empty’ source of calories. This means that, for the most part, you are getting few nutrients for the calories that you are consuming. Granted, white rice isn’t nearly as bad as sugar in terms of being empty calories and you are still getting some nutrients. Still, it’s clear that brown rice is much more powerful nutritionally. A key aspect of this difference is the fiber. For 1 cup of cooked rice, you get 14% (4 grams) of your daily fiber intake from brown rice (6) and 3% (1 gram) from white rice (7). This alone is incredibly beneficial as fiber is important for health and it’s critical that we get enough of it (8). In terms of absolute numbers, the difference may not seem much. However, it is still important, especially for people who don’t typically get much fiber in their diet. The site Precision Nutrition offers a useful examination of what fiber is and why it matters so much. Now, white rice isn’t always low in nutrients. In particular, companies will occasionally add back in some of the nutrients that are lost, resulting in a product called enriched rice (9). Here, you are getting more nutrients than white rice typically offers, although those nutrients are obtained artificially. What this means for health is somewhat debatable. 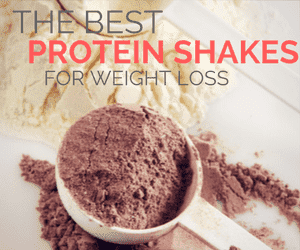 However, it’s normally a good idea to get your nutrients from whole foods wherever possible, rather than relying on nutrients that are added in. The difference in nutrient composition suggests that the debate about brown vs white rice is fairly clear cut. But, this isn’t actually the case. Instead, brown rice has some disadvantages as well. In particular, it contains a compound called phytic acid, which is known as an antinutrient. This compound can reduce your body’s ability to absorb some nutrients, particularly zinc and iron (10,11). Because of this, a diet heavy in phytic acid can lead to nutrient deficiencies. However, if your diet is balanced, this isn’t likely to be a problem. Additionally, some people argue that you can decrease the antinutrient content of brown rice by soaking it. And, as the site Self Hacked points out, there are some health benefits to phytic acid as well. A second issue is the presence of arsenic. Arsenic is a heavy metal and it naturally occurs in the environment. In high enough concentrations, arsenic can be toxic and it can increase risk of chronic disease (12,13). Both types of rice do contain some level of arsenic (14,15,16) and this tends to be higher in brown rice (17,18). If you’re having rice as part of a varied diet, rather than heavily relying on rice, the arsenic concentration shouldn’t be an issue. However, this is something to pay attention to if you are eating rice for most meals. You can also reduce this level somewhat by washing and cooking the rice in water that doesn’t have significant arsenic itself. This also suggests that if you do eat large amounts of rice, making sure some of it is white rice may help. Some research also suggests that the benefits of brown rice go beyond just the nutrients. For example, one area of focus is the impact that brown rice has on blood sugar levels. In particular, regularly consuming whole grains may help to decrease these levels and also lower type 2 diabetes risk (19,20,21). 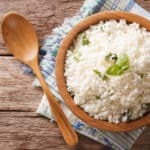 Indeed, replacing white with brown rice has been connected to lowering diabetes risk (22,23). In contrast, high levels of white rice consumption may increase the risk of type 2 diabetes (24,25). This happens even though white rice contains less sugar than brown rice (although both contain very little) (26,27). The difference may be the result of variations in glycemic index, as the GI of white rice is 72 and the GI of brown rice is 50 (28). As a result, brown rice will tend to increase blood sugar more slowly, which can be better for health. At the same time, research suggests that brown rice may help to reduce some risk factors for heart disease (29,30), partly due to the presence of lignans (31). Most research in this area has been linked to whole grain foods in general, with brown rice being one source of whole grains (32). For example, a meta-analysis of 45 studies found that higher consumption of whole grains resulted in a lower risk of heart disease (33). One reason for this pattern is that whole grains may help to improve cholesterol profiles (34,35). Rice doesn’t contain a large number of plant-based nutrients (certainly not as many as tart cherry juice or even coffee). Nevertheless, brown rice does contain some antioxidants (36) and can help levels of antioxidants in the blood for some people (37). Finally, choosing brown rice over white rice has been linked to better weight control and lower BMI (38). Once again, this is strongly related to whole grains, with people who consume more whole grains tending to weigh less and have a smaller waist size (39,40,41). With many people focusing on low carb or ketosis diets, either type of rice can seem unappealing, especially as it is so high in carbs. And, in fairness, rice may be a bad choice for some people and types of diets. But, for most, rice can be a good addition to the diet. In particular, it tends to be easy to digest and brown rice is also a good source of fiber. Rice is also extremely versatile, making it easy to include in meals. Additionally, brown rice is an important option for whole grains and it’s clear from the research above that this aspect alone can contribute to many potential health benefits. And, at the end of the day, conventional wisdom is correct. Brown rice does win out in the brown vs white rice debate, mostly because of the extra nutrients that it contains. The fiber difference also makes brown rice an especially good choice. At the same time, there are more health benefits associated with brown rice than with white. Nevertheless, both types of rice are fine to use in your diet and you certainly don’t have to avoid white rice entirely. ​What are your thoughts on rice? Do you like white or brown, or do you avoid it altogether?